Does your child love learning through apps? Ethan’s iPad currently has nine pages of apps on it. Nine! They’re all educational though and I have to say, I’m a strong believer in the value of educational apps for kids. There are so many apps available now and lots of them are blimmin’ brilliant. I honestly believe that learning is genuinely fun for our kiddies these days, and technology plays a big part in that. Are you looking for some new apps for your little ones? If you are, then please read on as we review two great apps from Kidlo. Kidlo makes a range of apps for younger children, aimed at developing hand-eye coordination, problem-solving skills, memory and creativity. Kidlo apps have won several awards and all content is approved by teachers. We were asked to review two apps from Kidlo – ‘KidloLand’ and ‘Kindergarten Kids Math Games’, both aimed at children aged 1-5 years old. There are free versions of both of these (with the usual in-app purchases), but if you subscribe, you get access to the full versions with a huge amount of content, as well as new content that is released each month. The apps are also ad-free, which is great. It’s worth mentioning that Ethan is at the top of the age range for these apps. Some of the activities are very basic for him while others are more challenging but he has still really enjoyed playing them. What is Kindergarten Kids Math Games? Kindergarten Kids Math Games teaches basic numeracy and simple Maths concepts in a fun way. Visually, like all Kidlo apps, it’s really bright, colourful and appealing to little ones. The best part is that it is very interactive and offers a huge variety of fun activities to teach number sense, geometry, sorting and categorising, counting, patterns, addition and subtraction. The app uses games, songs and puzzles to teach and I think its variety in learning methods is its big strong point. There are so many different activities to try, your child isn’t likely to get bored with it. You can download their favourite games to play offline, which is handy if you’re heading off on a long journey and need some entertainment. Ethan loves Maths so he really enjoyed this app. He said that he thinks the app is great for children who are learning to count to 100, the games are fun, and he likes that there are lots of different activities to try. Subscriptions cost US $4.99/month (around £3.84) or $29.99/year (around £23.07). Prices are correct at time of publication. You can find out more about Kindergarten Kids Math Games, and download the app, from the Kidlo website. KidloLand contains more than 1,000 interactive nursery rhymes, songs, games and storybooks, and has won several awards. We explored all the different sections which took a while as there are so many! Nursery rhymes, games, flash cards, learning the ABC, number games, colours and shapes, and lots more. You can trace letters, colour-in pictures, brush monsters’ teeth, learn the months of the year, do some musical colouring, and read simple stories. There really is so much content here. Ethan found it very easy to use, swiping through all the different activities available. The stories, in particular, are great. There are simple stories for beginners, or ones that are slightly more challenging which are more suited to Ethan’s age group. You can also choose and download your favourite activities so that they can be played offline too. Subscriptions cost US $4.99/month (around £3.84), US $24.99/6 months (around £19.23) or US $39.99/year (around £30.77). Prices are correct at time of publication. You can find out more about KidloLand, and download the app, from the Kidlo website. I’m happy with Ethan having a little screen time each day, as long as I know he’s learning. 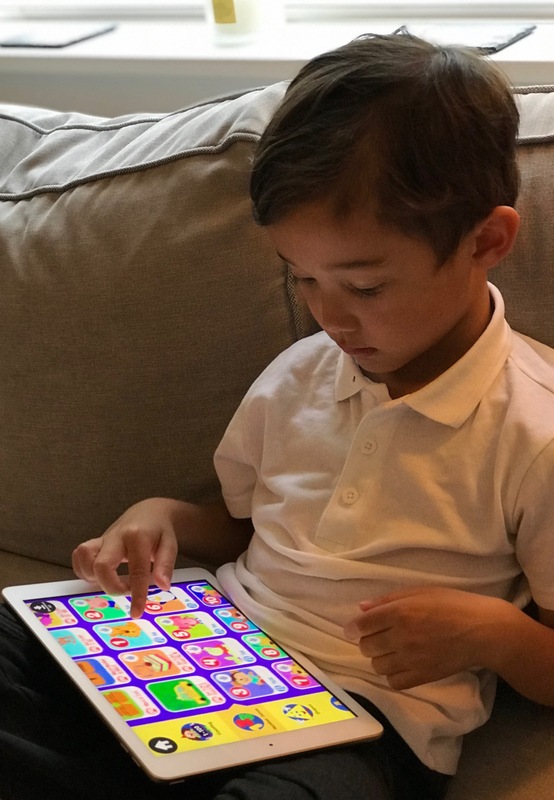 He has really enjoyed using the Kidlo apps. I think they’re brilliant educational apps for kids. Bright, colourful and easy to use, with an incredible amount of interactive and engaging content. These Kidlo apps will keep your little ones entertained and give them a good foundation in numeracy, literacy, creativity, and problem-solving, in preparation for school. Which educational apps do your children enjoy? Please share in the comments. Disclaimer: Mums Off Duty was gifted six months access to ‘Kindergarten Kids Math Games’ and ‘KidloLand’ for the purposes of review. My reviews are always completely honest. Do you think your little one would enjoy these Kidlo apps? We’re offering three lucky readers the chance to each win a one month subscription to both ‘KidloLand’ and ‘Kindergarten Kids Math Games’. Full terms and conditions are available below. Good luck! My grandaughter has the Nick Jrn games app.